Hydrogen Carbon cleaning uses highly charged particles of oxy-hydrogen (HHO). This is feed into the engine via the air intake and supercharges the combustion process. As it passes through the induction system, the hydrogen reacts with the carbon deposits turning them into hydrocarbons. The carbon deposits bond to the hydrogen like a magnet so as the carbon gets broken down, it gets sent out the exhaust with all the spent gases. You can be sure your engine is in safe hands, this simple and safe process requires no dismantling of engine parts other than loosening a small section of the air intake pipe so we can insert the HHO pipe. We do not cause stress by over revving your engine, instead it is left on idle and our machine does the hard work. Unlike smaller inferior machines that struggle to clean carbon which also have to over rev the engine to try and expel the carbon. The CC-16 produces 1800ltrs of HHO per hour! 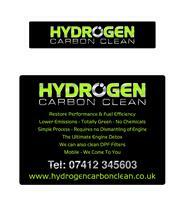 We chose the biggest and best machine available so you will get the very best engine carbon clean possible. Also do Aqua / Vapour Blasting Inside A Large Cabinet. Aqua Blasting what is it? Vapour Blasting, Vapour honing, Aqua Blasting, Slurry blasting, Wet blasting. These are all generic names used to describe one of the safest and most gentle ways of cleaning various metal and non metallic items using just the power of water, air and tiny small glass beads. Items such as alloy engine blocks , heads, cam covers, pistons, rocker covers, carbs, fine items, fittings, housings, gear boxes , military, aeronautical, marine, just about anything can be cleaned to a to a brilliant shine without altering critical dimensions, or scratching. Grime, burnt-on carbon, paint, scale, rust, dull, tarnished, weathered, aged, etc, all removed simultaneously. No toxic or harmful chemicals - no atmospheric or environmental pollution. No component erosion - critical measurements are maintained. Capability of processing most types of material. The cleaning process is made up of air, water and fine glass beads which is accelerated using a constant high volume and pressure onto to the work piece surface, gently cleaning and polishing the item. Aqua Blasting, unlike dry blasting techniques does not rely on impact to do the work, as this can damage your parts, Instead Aqua Blasting is washing the work surface using the power of water and air pressure to clean your items gently and the small glass beads help to gently polish the surface to prevent any damage to you valuable items. By using Wet Blasting scrubbing method, the work surface is cleaned, contamination and surface deposits removed, and any scale or burrs disappear, leaving a nice bright cleaned surface. Typically with different metals such as alloys, the newly cleaned finish will have a brilliant shine just like new. Another advantage of Aqua Blasting is the superior finished look compared with other cleaning methods by hand and using chemicals or dry blasting. Bulk discount on job lots. Ideal for motor bike and car restorations.